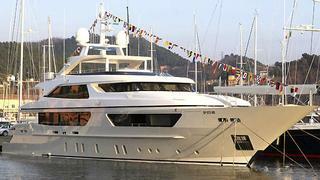 Word comes from Steve Martin at Sanlorenzo Americas that he has signed as CA for the 46m Sanlorenzo superyacht Carol. This 46m tri-deck superyacht is built in steel and aluminium to a design by Viareggio Division Style, Sanlorenzo's in-house design studio. Her exterior lines echo the Sanlorenzo style in other series from the yard, and the design is intended to provide maximum daylight to the interior. She accommodates 10 guests in five suites, and there are quarters for a crew of nine. There is also a stern beach club, a large lateral tender garage, a toy garage below the foredeck and a lower deck housing technical and service areas. Carol is powered by twin Caterpillar 3512B engines giving a top speed of 17 knots, a cruising speed of 15 knots, and a range of 4,000 nautical miles at an economical speed of 12 knots. Lying in La Spezia, Carol is asking €14,995,000.